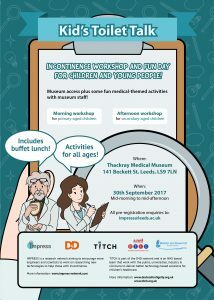 TITCH and Impress have joined forces to develop an incontinence workshop focusing on the needs of young people age 6-16. This free workshop on 30 September 2017 will be hosted at the Thackray Medical Museum in Leeds where our visitors will have chance to take a tour of the museum and participate in some fun medical related activities specially organised for them by the Museum. The workshop is primarily aimed at young people and their parents or carers but is also open to specialist healthcare professionals and research engineers interested in participating in the morning and afternoon workshop sessions. You can register here.